A look back at the 2016-17 Barrie Colts season. #OHL - Very Barrie Colts | A website covering the Barrie Colts of the OHL. This past weekend the Barrie Colts played their last game of the 2016-17 season. The team finished the regular season in last place with a 17-44-6-1 record. This is only the second time in team history that the team has not qualified for a spot in the post season. A big fall from last season where the team won the Central Division Title with a 43-22-0-3 record but I don’t think anyone is surprised there considering the level of talent that didn’t return this season. There were not many bad surprises this season. I think it played out about as expected for the most part. The team was the youngest in the OHL dressing 12 rookies. Tom Hedberg lead the way scoring 4 goals and 20 assists for 24 points total. You would have to go back to Aaron Ekblad's rookie year in the 2011-12 season to find a rookie blue line with a higher point total in his rookie season with Barrie. Ekblad totaled 10 goals and 19 assists that season. It is worth noting that Ekblad played 7 more games in his first year and played on a way better Colts team. Hedberg is a little older/more mature than most of the other rookies but we won’t hold that against him because he had an amazing rookie campaign. He is also a defenceman and managed to get more points than Centre Jason Willms who played in 12 more games. Hedberg was 3rd on the team for power play points with 1 goal and 11 assists with the man advantage. Jason Willms was outstanding for the Colts in his rookie season as well posting 13 goals and 10 assists in 68 games played. Kade Landry (1G;22A) also finished the season with 23 points over 61 games. 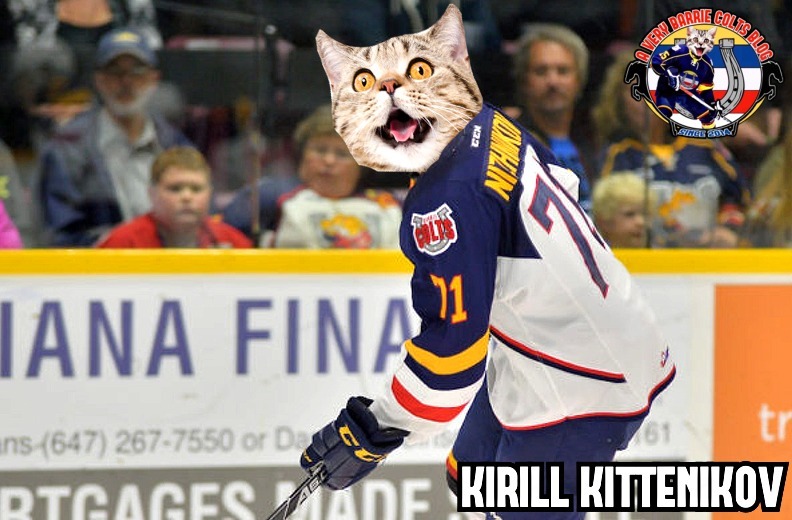 Kirill Nizhnikov had a lot of expectations on him when he came here to Barrie and though he only saw 43 games, he managed to still have a solid season. His 12 goals were the 2nd most for rookies on the team and finished the year with 19 points. Nizhnikov showed great speed and had a great ability to control the puck. An area the team could learn from him would be his willingness to shoot the puck finishing the season with 110 shots on goal. Only area that didn’t look great was his -26 on the year. Kirill has shown a lot of potential but if he can work on playing a 200-foot game he could really become a top guy in this league. Tyler Tucker was also outstanding for the Colts this season. 1 goal and 13 assists over 62 games played. Tucker was outstanding defencively. He showed that he was a useful player in all areas and was excellent on special teams. His -12 was the 2nd best rating among players who played over 60 games for the Colts, 2nd to Anthony Stefano. One of Tuckers greatest abilities was how aggressive he was. He hit everything that moved. He brought a level of physicality that the team lacked, especially with OA Roy Radke missing so much time due to injury this season. I think moving forward that Tucker will be one of the guys to keep an eye on. This season we have 2 players moving on having completing their OHL careers. 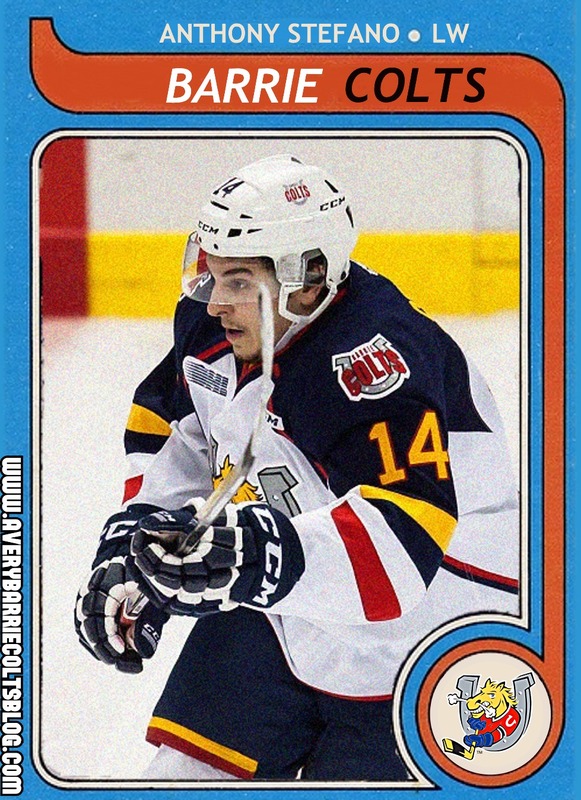 Anthony Stefano finished his OHL career as the Barrie Colts point leader. His 22 goals and 34 assists were a career high for him. Over 4 seasons he laced the skates for 3 teams. Selected in 2012 by the Peterborough Petes 86th overall in the 5th round, he played there for about a season and a half before getting moved to Windsor. Over the next season and a half (50 games) he would get moved to Barrie in a deal that saw Brendan Lemieux moved to the Spitfires. Stefano played 102 regular season games with the Colts where he put up a total of 38 goals and 49 assists for a total of 87 points. Roy Radke didn’t get to finish his OHL career as he would have hoped missing a large part of the season with injuries but still managed to be a huge force on a team in a rebuild. In 45 games this year, Radke put up 23 goals and 13 assists. He spent all 3 of his seasons here with the Colts who drafted him in 2012 243rd overall (12th round). In 3 seasons, he played in 175 regular season games where he scored a total of 51 goals and 42 assists to total 93 points. In the 2015 NHL draft he was selected by the Chicago Blackhawks in the 6th round with the 147th pick. Radke has since signed a deal with the Rockford IceHogs which will give him a chance to make the team. We would like to thank the OA players for their time in Barrie and all their hard work with the Colts. How the Colts ranked league wide. The Colts longest winning streak this season was 2 games at the start of the OHL season. Their longest losing streak was 9 straight from Jan, 20th- Feb, 9th. Last season, the Colts longest winning streak was 8 games and their longest losing streak was 2 games. Anthony Stefano: 22 goals, 34 assists, 56 points. Lucas Chiodo: 22 goals, 31 assists, 53 points. Zachary Magwood: 19 goals, 18 assists, 37 points. Roy Radke: 23 goals, 13 assists, 36 points. Ben Hawerchuk: 15 goals, 16 assists, 31 points. When Mackenzie Blackwood moved on to the American Hockey League, there was some concern over how the goaltending could look here in Barrie. David Ovsjannikov was returning which was a plus considering how solid he was last season. Ovsjannikov was called upon for some big games at the seasons end and in the playoffs during Blackwood's suspension and when he got called to play for Canada's World Junior team. Ovsjannikov was good for the Colts this season and before the new year played in a large part of the games with Christian Propp backing him up, while seeing some action. After the new year, Dale Hawerchuk went to a 3 goalie rotation and included Ruan Badenhorst. Ruan played very well but it was clear that Christian Propp was the stand out of the two back-ups. Here is a look at the numbers of the Colts goaltenders this season. This season was tough as a fan but there are lots of good things to look forward to. Barrie is loaded with young talent that will only get better. Guys like Tyler Tucker, Justin Murray and Tom Hedberg should develop into a very solid blue line that can produce and bang bodies. Chiodo and Finoro have come a long way and no doubt that both will get even better when in a position to play more. Christian Propp will get more starts and he will continue to develop. And most important is the Colts have the 1st pick at the upcoming OHL draft. This team is able to be better next season and have a chance to set themselves to be an even stronger team the following year. If Barrie is able to convince Jack Hughes to come to the Colts, he could really help give this team a huge bump. Talk is that he doesn't want to report but there are rumours going around that the team is doing things to try and get him interested. Either way, there is lots of strong talent in this draft and no matter what the team will end up with a solid player to add into their system. Turcotte, Bertuzzi and Suzuki are also names you could hear called out when the Colts make their selection. On Monday, March 27th we will be announcing the winners of the first annual Pony Awards! Included is an award for the 'Fan Favourite' which allows fans to pick their favourite player! For more info on the awards and where you can vote go here. Voting for your fav player ends at 11:59PM on Sunday, March 26th.